You read that correctly - for the second year running Codit Belgium has been certified a Great Place to Work! 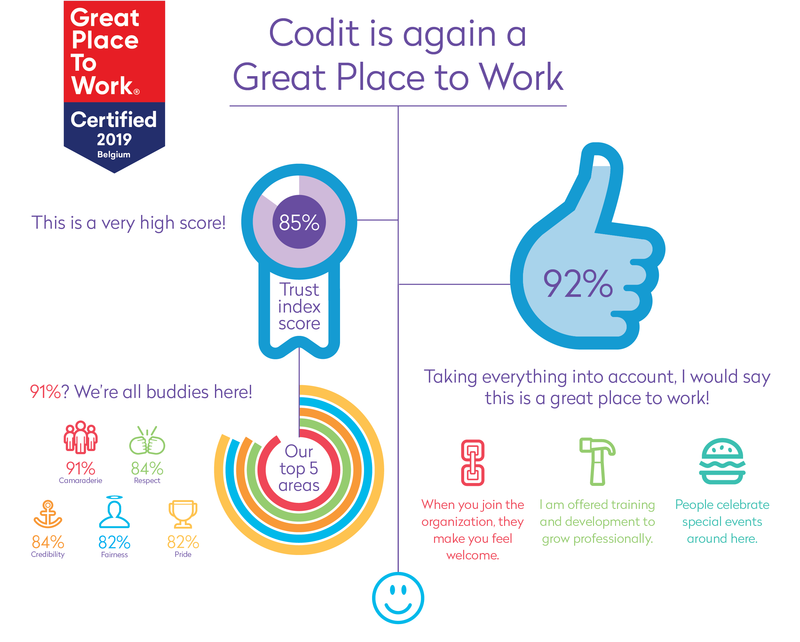 We have some amazing news to share with you – for the second year running Codit Belgium has been certified as a Great Place to Work! Training and development to support professional growth. When you join the organization, they make you feel welcome. We’re incredibly happy with these results because it’s a reflection of the warm atmosphere that we’ve put a lot of effort into creating, to make Codit’ers feel supported and happy. “When I saw the results of the Great Place To Work survey I became instantly happy, not only because we can see our team is happy but also because the categories we scored highly in are in line with our core values: quality first, dedication to innovation, and a happy place. That proves that our intentions are felt and lived within Codit. Great Place to Work Belgium explores the level of trust, pride and happiness within organizations by having employees complete an extensive survey. The results of this survey are then analyzed and only organizations that achieve top scores receive the Great Place to Work title. This is a fantastic acknowledgement of the energy that we pour into making our team feel fulfilled in their jobs and in the workplace. We’ve got more plans lined up to make our workplace an even greater one in the future! We are officially certified as a Great Place To Work!